Over the past three years, we’ve tested over a dozen sous vide setups to find the best for your kitchen. We like the Anova Precision Cooker (Wi-Fi Edition) the best because it’s reliable, works with almost any container, and has a decent app that you will actually want to use. If you don’t need the range of Wi-Fi, Anova also makes a cheaper, Bluetooth-only version. This post was done in partnership with Sweethome, a buyer’s guide to the best homewares. 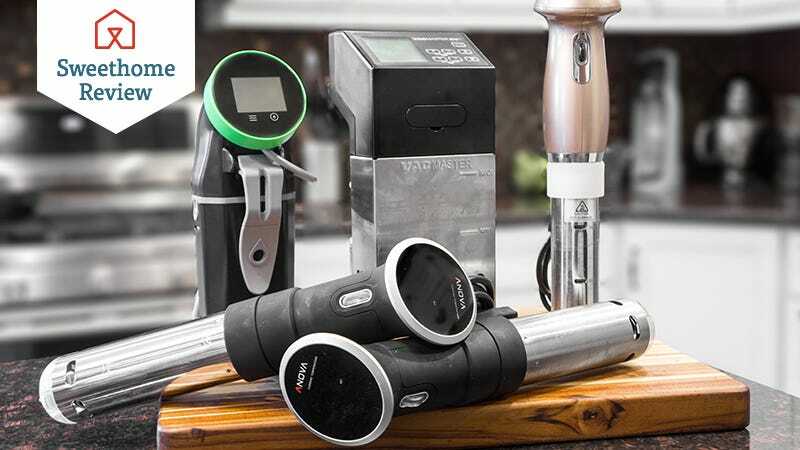 This is a condensed version of The Best Sous Vide Gear; read the full review here. Sous vide cooking recently burst into the public consciousness, riding high on its prevalence in high-end restaurants, a glut of demystifying literature, and a slew of successful Kickstarter projects that made at-home equipment more affordable. Now it is a mainstay of cooking shows and Internet discussions. Sous vide involves sealing your food—ideally within a vacuum—and then immersing it in warm water for hours at a time until the entire thing reaches a uniform temperature. The result? Steak that’s a perfect medium rare throughout (no cold, raw centers or overcooked outsides), chicken so tender that you don’t even need a knife, and eggs the consistency of custard. That’s what sous vide can do. And for the most part, making that happen is quite easy. There are primarily three different types of sous vide cooker: the immersion circulator that can simultaneously heat and circulate water, the all-in-one but less-precise water bath, and the bring-your-own-heat controller. We’ve tested all of these types over the three years we’ve reviewed these things, and found that the immersion circulator is best for most people in most situations. These are gadgets that latch onto the side of a vessel—be it a pot, a plastic tub, or even a cooler—and not only heat the water but also use an impeller to circulate it around the container. Among these, you want something that accurately maintains temperature, is quick to heat up, and affordable. We tested five immersion circulators in our most recent round of testing in 2016 and found that one stood above the rest in all these respects. For three years now we’ve tested sous vide cooking tools, and the Anova Precision Cooker (Wi-Fi Edition) makes the most sense for a home chef due to its low price, ease of use, and ability to adjust to pots and containers of almost any size. Though its heating element is underpowered compared with those of some of its competition, this tool’s flexibility and stowability make it more useful for most people. And, like just about every sous vide circulator we’ve tested, it’s stable and accurate enough to use for even the most exacting of cooking techniques. The addition of Wi-Fi provides a stable wireless connection and the ability to set and control the cooker remotely, whereas the Bluetooth version connects only to an app within limited Bluetooth range. About the size of a rolled-up newspaper, the Anova Precision Cooker (Wi-Fi Edition) is smaller than pretty much anything else available, including the older Anova models. The clamp that attaches to the container of your choice is connected to a ring that has the unique ability to slide up or down the length of the shaft to accommodate vessels of varying height. Anova has even told us that the Precision Cooker (Wi-Fi Edition) can sit flush on the bottom of a container without blocking the water flow at all. All the other sous vide circulators we’ve analyzed have attachment mechanisms that are fixed in place, giving you far less flexibility when it comes to cooking vessels. The adjustable mount also means that you can swivel the main column, which is great if you want to look at the dial from a different position. Connecting the Anova to a wireless network is painless thanks to the cooker’s Bluetooth bridge; it allows for an ad hoc connection directly to your phone using an app (iOS, Android), where you can then put in your Wi-Fi password to share with the circulator. Once you pair the cooker, you can set the temperature and timer remotely. Whereas you might not have wanted to attempt remote cooking with the flaky Bluetooth connectivity on the previous model, Wi-Fi provides a more consistent connection, which helps maintain safe food temperatures by alerting you if the power goes out mid-cook. It’s nothing fancy, but it works and is genuinely useful. The Anova’s one major flaw is that its 800-watt heating element is pretty weak compared with those of other models—it’s 300 watts less powerful than its predecessor, in fact. This makes it about four to eight minutes slower to bring a 5.5-liter pot of water to steak-cooking temperature, compared with other models. However, this is by design. Though most modern kitchens run on a 20-amp circuit, older buildings can have circuits running as low as 10 amps, which means an 1,100-watt heating element is already pushing close to the maximum of 1,200 watts. Adding anything to that same circuit will trip the breaker, causing you to lose power while cooking. By going with a less-powerful 800-watt heater, the Anova is slower to start, but more likely to finish. You can also speed up the process by preheating water in a kettle or on the stove. 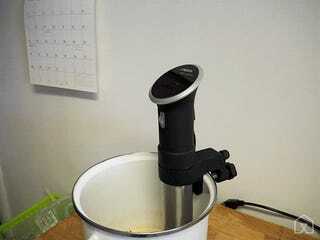 If you want the benefits of the Anova Precision Cooker (Wi-Fi Edition) but are willing to give up some functionality to save a few bucks, the original Anova Precision Cooker is still a great buy. It does everything the newer version does (except connect to a Wi-Fi network) and it usually sells for about $20 less. We found the two to be equally accurate, equally loud, and equally as power efficient. Oddly, though they seem to be identical, the Bluetooth model we tested did take about five minutes longer to heat up the water bath in our tests, but again, you can mitigate that issue by starting with hot water.